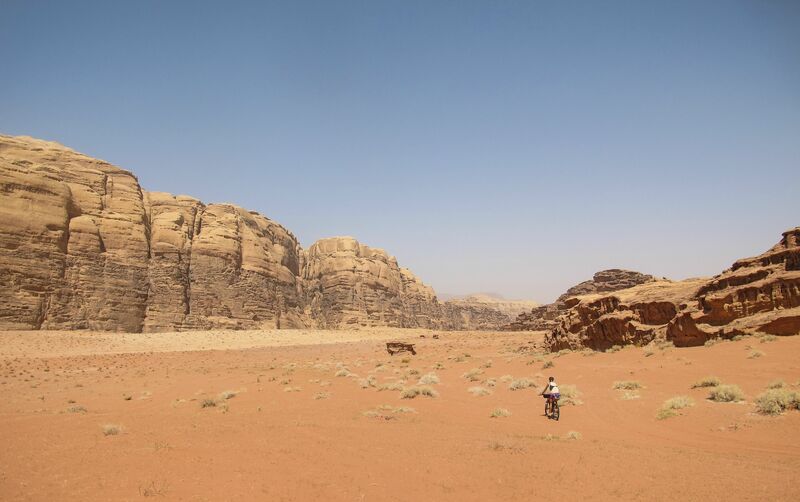 Ever since I got a fatbike, I've remembered Wadi Rum, that sandy wonderland that puts all other fantastical desert landscapes to shame. 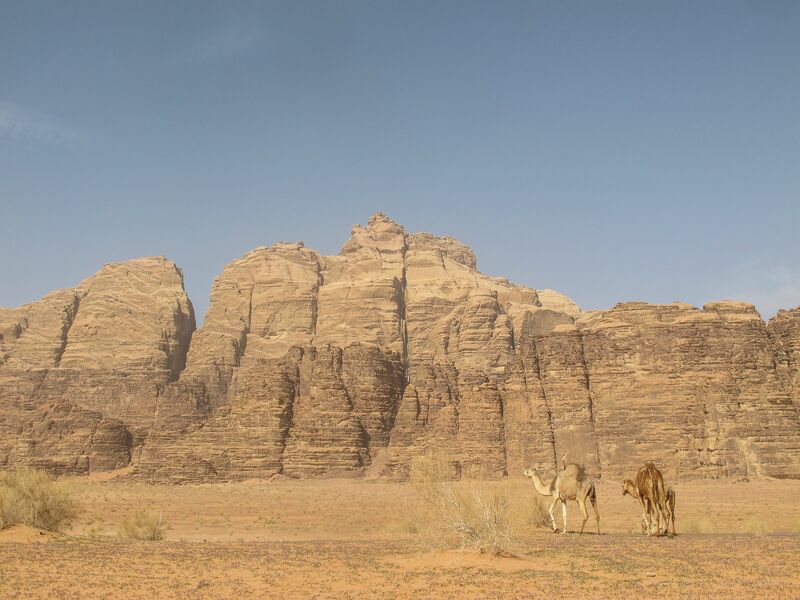 The region, at Jordan's very southern corner, the gateway to Arabia, couldn't be more perfect for extra-wide tires - sprawling expanses of soft sand to crawl across, where going by foot is slow and arduous, and by camel, high-maintenance. 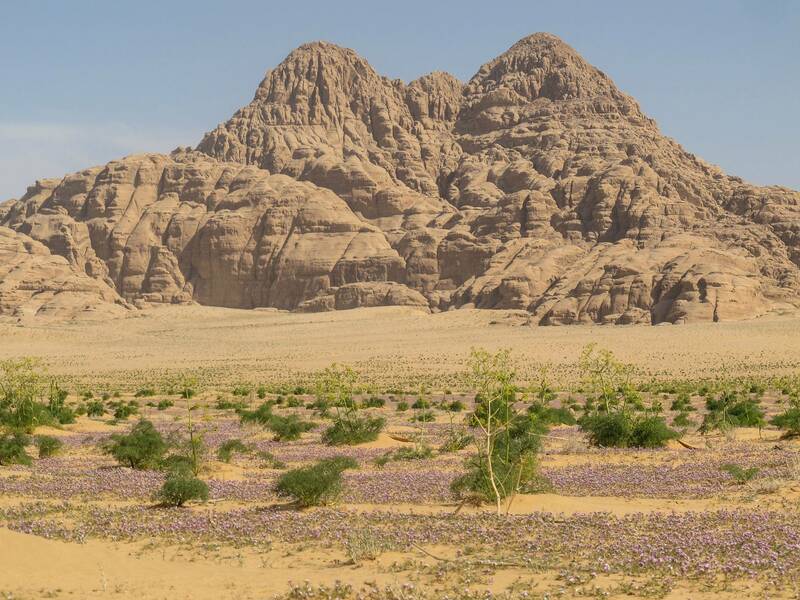 If you like rock scrambling, so much the better - while the loftiest peaks require ropes and good climbing knowledge to summit without a guide, there are hundreds of viewpoint pinnacles on the lower sandstone jebels arising from the rolling sea of pink sand as far as the eye can see. I'd picked up a used Pugsley the previous summer, a great Craigslist find, and from the Fishtown backyard where it had spent most of its several years of life (when not downhilling in the Poconos), I flew it halfway around the world, where a busy work schedule kept it languishing for too long in a Jerusalem apartment. 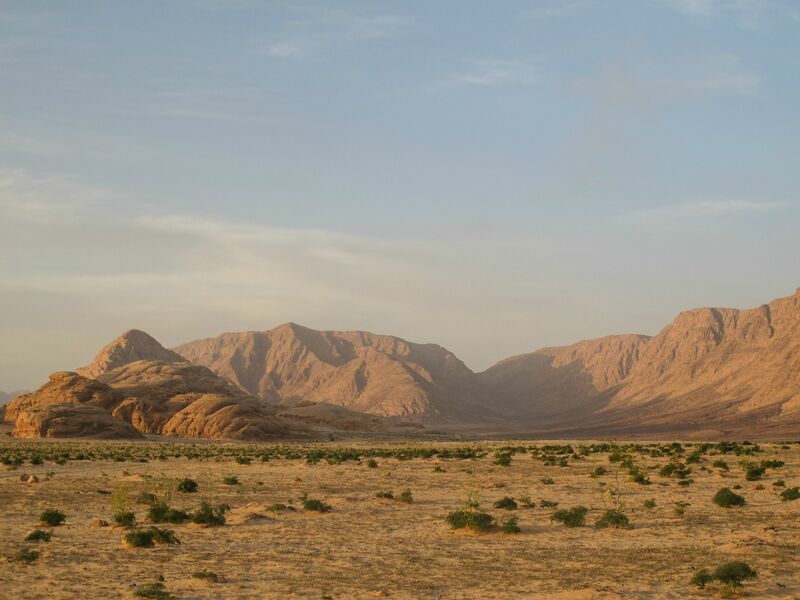 But its time came, and it was down to the Eilat-Aqaba border crossing, where you can enter Jordan for free instead of with a whopping fifty-dollar fee and mandatory fifteen-dollar, five-minute bus ride. 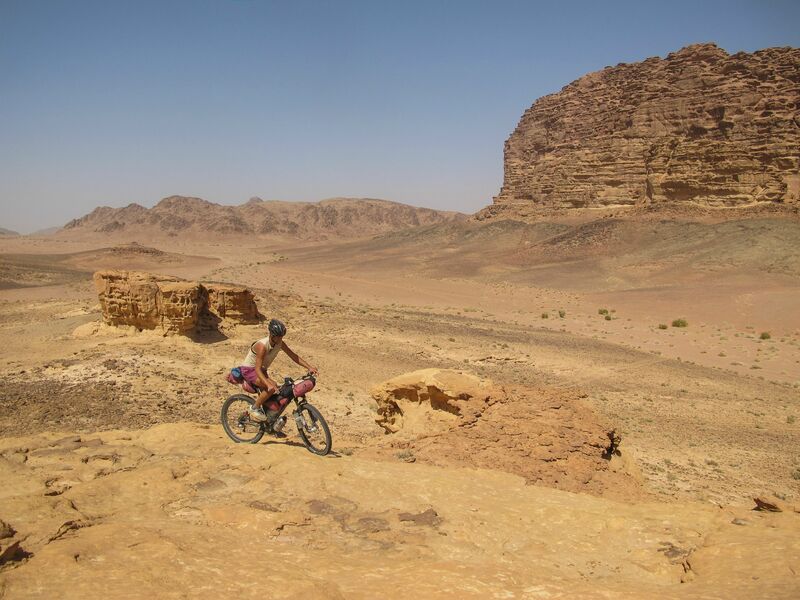 I joined up with Nick and Lael, my patchy knowledge of Jordanian geography and the water spots between Petra and Wadi Rum making a meager attempt at a match for their well-honed backcountry wandering experience, bicycle knowledge, and highly conditioned cycling legs. The night before crossing, looking at a view I never get tired of - the intimidating Aqaba Mountains over the gulf that is the right rabbit-ear of the Red Sea. Thanks to Nick and Lael's friendship with a local mountain biker of a truly religious fervor, who also happened to work at the city aquarium, we camped on the floor of a round room ringed by fish tanks. All night I took pleasure in knowing the fish were right there, swimming round and round the carousel. 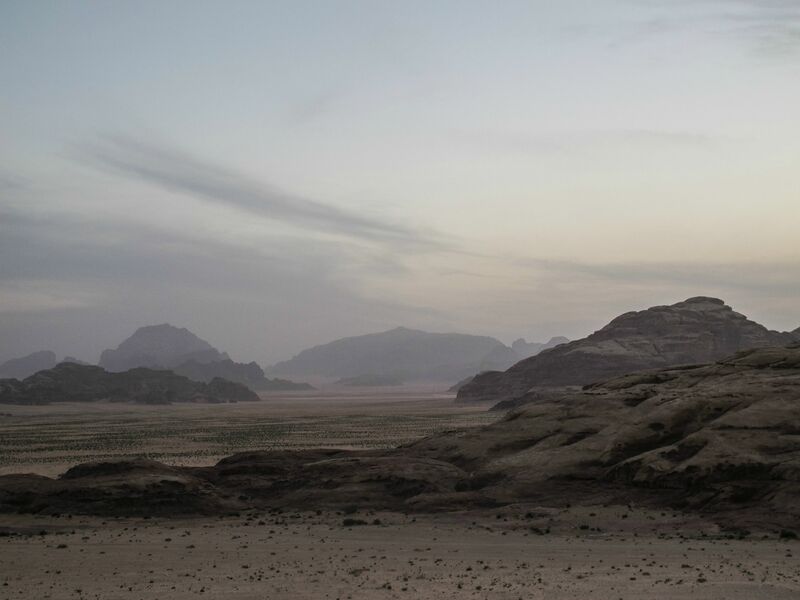 Then it was time to cross to Jordan. 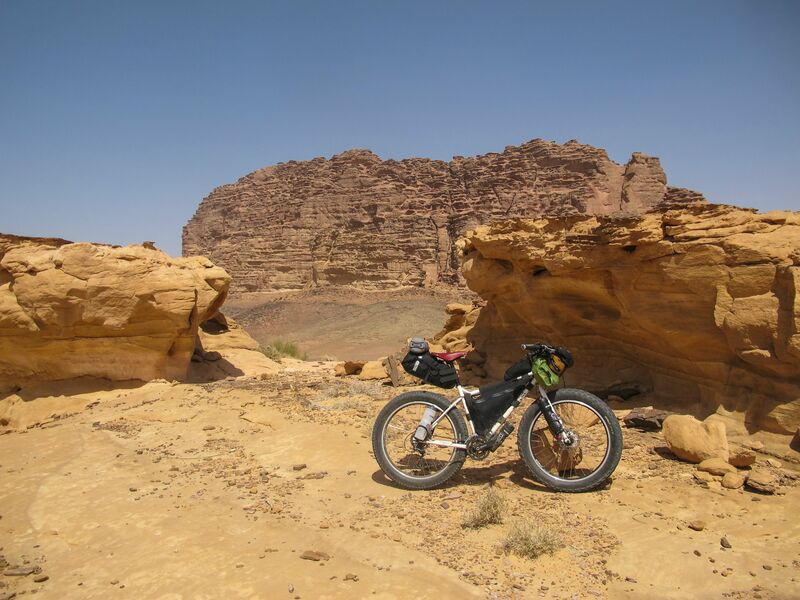 There was a bit of unnecessary hullaballoo about getting our bikes through the small military zone just on the Jordanian side of the border, where taxis are the only vehicles allowed; see the logistical section at the bottom of this page. We ended up being dropped off at about 130 meters of elevation, a head start which I greatly appreciated, as my unconditioned legs were dreading the climb to around 900. 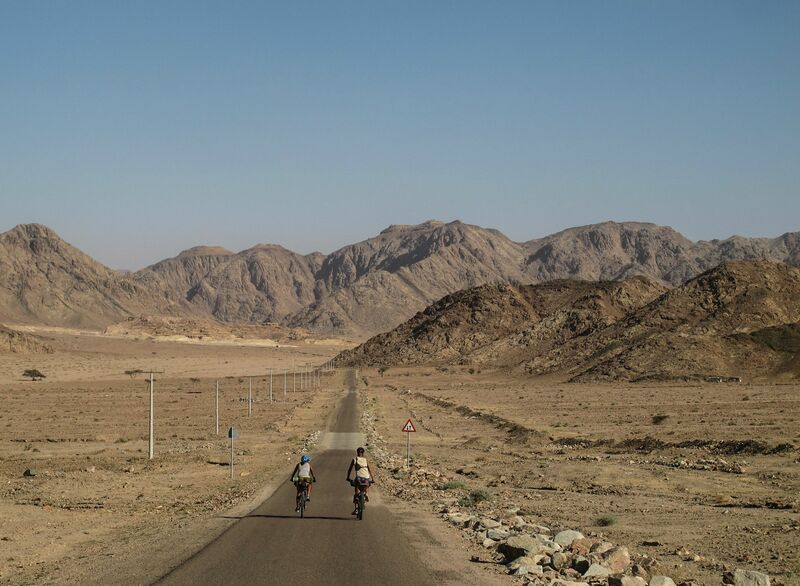 We mainly followed asphalt roads on the climb up; I'd been sent a GPS file showing an allegedly-rideable (though as far as I knew, untested) route from Rum to Aqaba. It featured a crossing described charitably by my local contact as a donkey path, over a range I knew to be formidable, having crossed one of its more dramatic notches a year earlier in a failed attempt to find a usable trail across it. 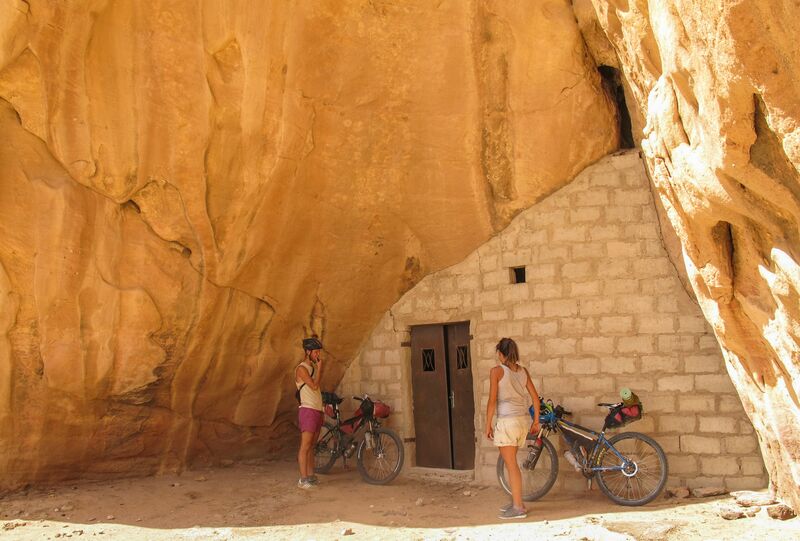 Not relishing the thought of a tough hike-a-bike, we stuck to the rumble of Larry and Endomorph tires on pavement. We gained over 800 meters on pavement that day, a true hazing for my bike legs - as always, it seems when I set out on a multi-day trip, out of shape from several months of having hardly ridden. These two kindly waited for my much slower pace, while I fantasized of the sands of Rum giving my fat tires enough of an advantage that I might be able to stand in something of the same league as them. The climbing became easier when we reached the high plateau pictured above, and we even enjoyed a bit of a downhill interlude. 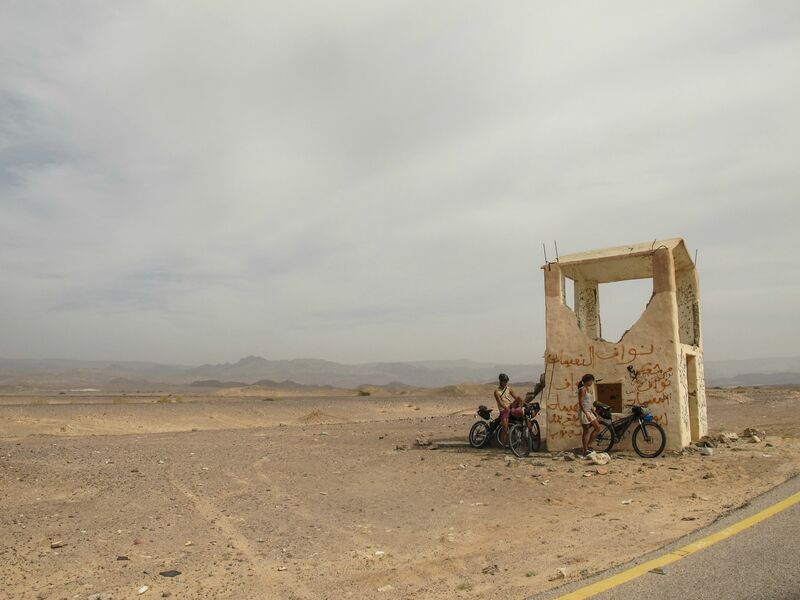 Up in the high desert, our first planned water stop - the tiny Saudi village of Titen. 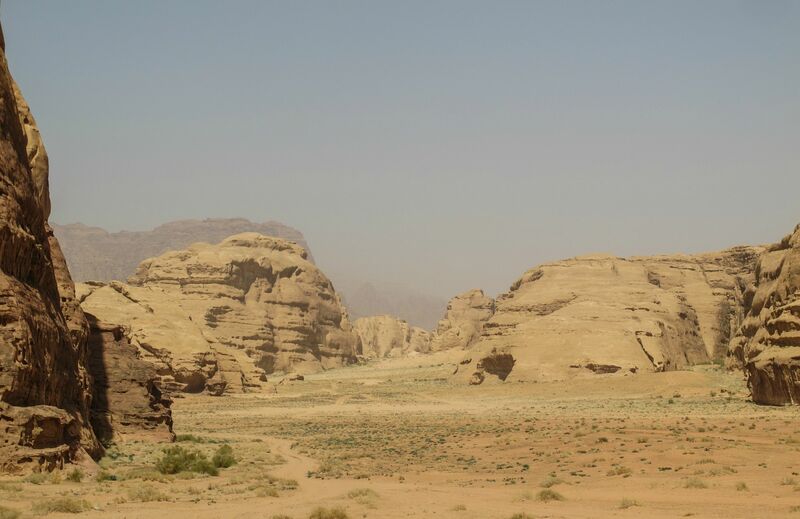 Saudi because it was once part of that notorious kingdom; the KSA traded about twenty miles of land to Jordan in the 1960s for a much larger patch of useless desert, presumably out of pity for Jordan's lack of coastline. The coast has since been put to good use as a shipping center, but these inland boondocks howl with scouring wind with nobody to hear. 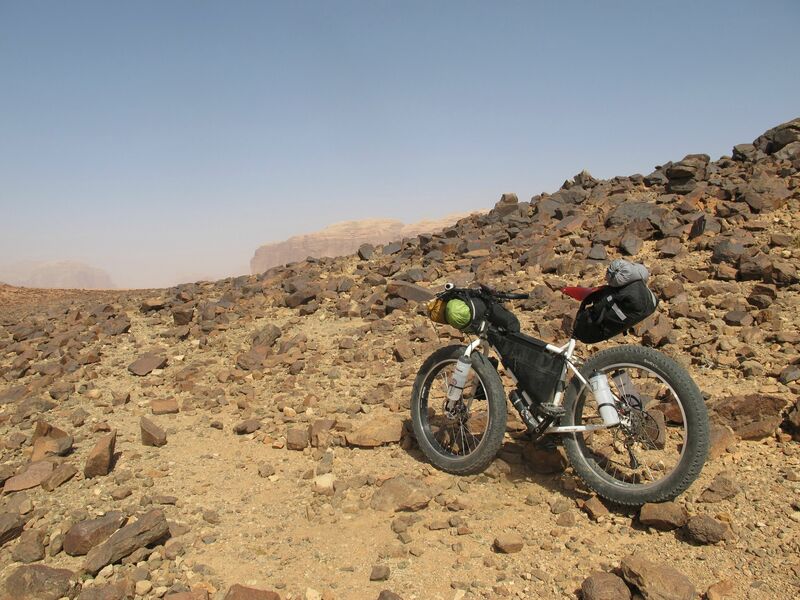 As was typically the case on road stretches, my companions had long vanished onto the horizon ahead, and I took a detour to test my fat, fat tires on a wadi-bed shortcut to town. 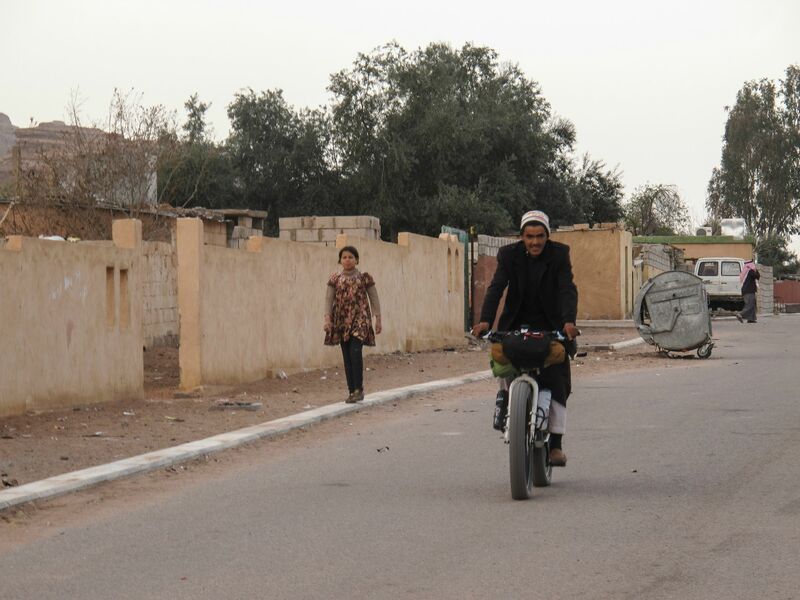 On reaching town, I realized I might have passed them if they'd stopped somewhere on the road waiting for me, and contemplated my fate of asking every bewildered pickup truck rolling past if they'd seen two more foreign weirdos on loaded bikes like me. Luckily I spotted said weirdos resting in the shade of a wall just ahead, and we met with surprisingly little fanfare from the dozens of pickups (more people, it seemed, than this little collection of one-floor houses could possibly boast). You never know when you're going to be mobbed with eager attention, or waved at politely and then hardly noticed. The others had already stopped for water at an army post just across the way, and, needing to fill up for the longish push to Rum village, I headed over to do the same. For some reason, where they'd just been given water, I got tea and a lively chat with the one officer who spoke English. I think he introduced one of the other guys sitting there drinking one of the four cups of tea (among about twelve guys) as General Somebody. Why General Somebody was chilling at a podunk army post on the edge of the Saudi marches, I could only imagine; maybe it was a joke I missed. After inquiring after the size and scale of Texas, expressing some reluctance to believe that it was really many times the size of Jordan, and informing me of the dangers of Death Valley - where dehydration could dessicate a man from 80 to 25 kilograms - the group's mouthpiece insisted on giving me something more than water. "Maybe a little bread?" I ventured. Always good to have bread. "Go bring some bread!" he hollered to one of the assembled lower-rankers. "And oranges and bananas and cheese!" 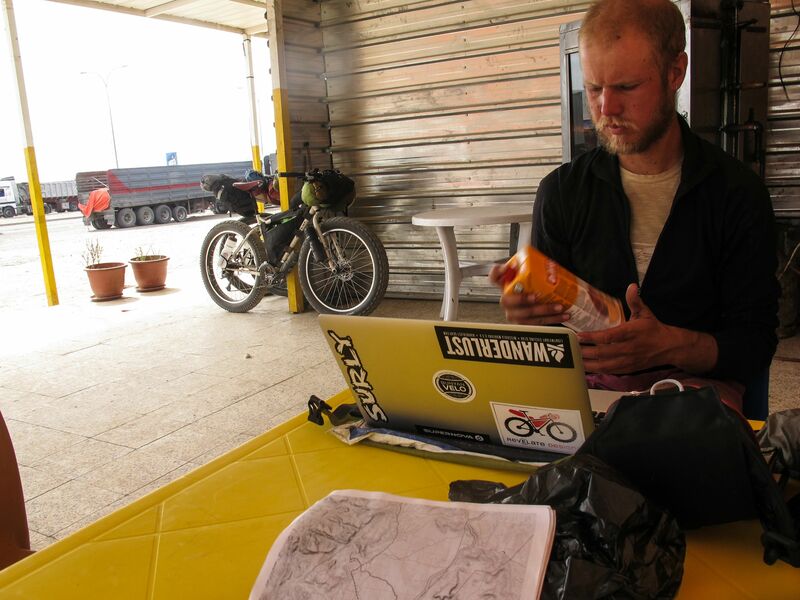 With 8 liters of water and already plenty of food crammed into every cranny of my incapacious bikepacking bags, I was mildly alarmed, and still more so when the quantity of food brought was equal to or greater than the amount I already carried. 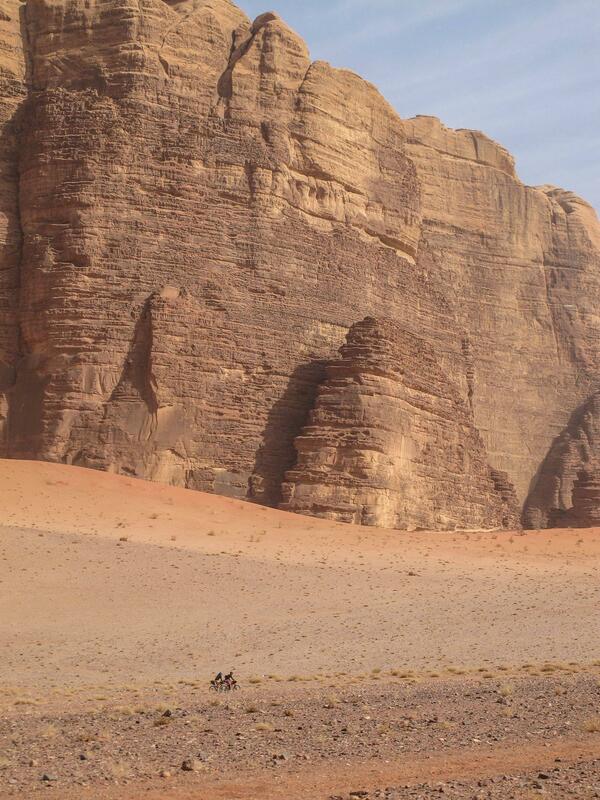 I also asked for an opinion on the nicest wadi of the several which presented themselves from our viewpoint. "What do you want to do in the wadi?" "We'll sleep there tonight," I attempted with confidence, knowing the skepticism this might elicit. "But what about the danger?" After taking about half the food on offer and planning to turn some over to my partners, I promised that we had maps and GPS and knew the way, and rolled off to distribute the plunder. I didn't pack as minimally on this trip as I'd have liked. I carried a day pack in addition to no fewer than five liters of water on the bike (I pulled a Joe Cruz to max out the Pug's ability to emulate a camel) and full bikepacking setup (out-of-production Revelate Sling handlebar roll; frame and saddle packs by Greg Wheelwright/Bolder Bikepacking). Part of the bulk came from bringing plenty of clothes; I'm a cold sleeper and expected very chilly nights, though the amount of wraps I brought ended up being overkill. 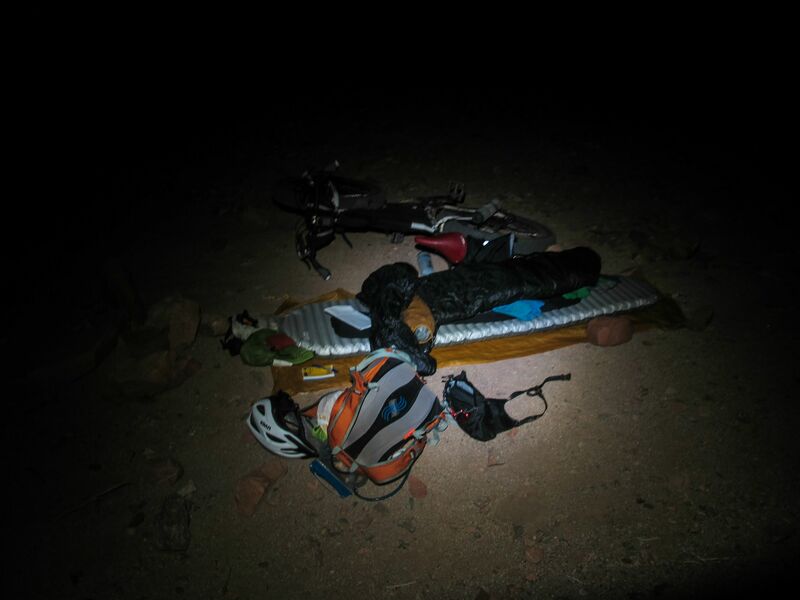 I overstocked on food at the end of the second day, and otherwise might have been able to make it work without the backpack, but I was glad overall to have it - it also let me increase my water capacity to eight liters, helpful for on some of the longer stretches. On the other hand, Nick and Lael managed with little more than 4-5 liters of capacity each. I drink a lot of water. The flat tires were the bane of the trip, convincing me of the need to go tubeless and stealing many hours in futile repairs. It shouldn't have been such a big deal, but for ridiculously bad luck - my rear tube pinch-flatted, and after patching, the lining around the vase of the valve developed a leak, leaving the tube irreparable. The backup tube I'd brought had a previous pinch-flat patched with some self-adhesive patches which I can't recommend; one of them came loose and subsequent repair attempts never lasted more than a day and a half, as the repeatedly glued and sanded area of tire refused to hold a patch. As a backup, I ran a borrowed 29er tube for the last segment; it gave in too, to abrasion from the extremely worn Endomorph. Another 29er tube and a 26er also got me no further than three kilometers, bringing the trip to a five-tube kill count. The Endomorph has now been replaced and the Pugs converted to tubeless. I'll never go back. A supply stop in Rum got us the boxed feta I'd enjoyed in Egypt (the same brand, imported!) as well as far more supplies than we needed, given how many more towns we'd reach. Our bikes parked outside the shop drew relatively few onlookers - and almost as many guys asking if we had a guide, then looking surly when we said we didn't. 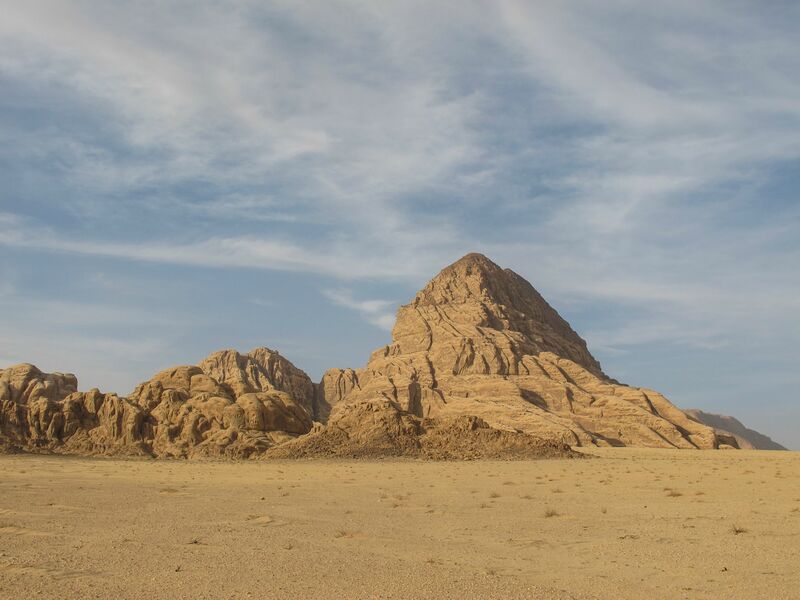 Given that guiding is one of the major forms of income here, there's a tendency for locals to feel that they're being robbed if none of them are getting paid by a particular traveler. Never mind that there's nobody in Rum who could guide us mountain biking, whatever that would consist of, even if we wanted them to. We ended up not getting out of town until nightfall, and camping a little way out of town, alongside Jebel Um Ishrin - but not far enough enough off the jeep tracks to escape a couple people pulling over to inspect us; one helpfully warning not to reach under rocks for fear of snakebite, the other bugging us to hire him as a guide. Despite the ongoing traffic well past our 8:00 bedtime, we slept pretty well. 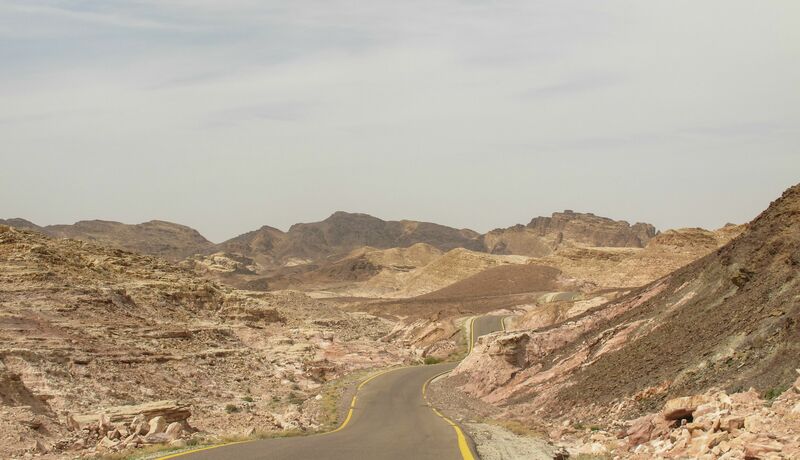 Heading up Wadi Um Ishrin. It proved to be one of the sandiest stretches yet, and quite a drain on morale, especially for those not running 4-inch tires. For once I didn't feel like a burden on the group's pace! But interspersed with a lot more of this than anyone cared for. Even the Pugsley had issues at quite a few points. Presumably fatter fatbikes could fare better. My Pugs has the narrowest wheels that can be called "fatbike" - 3.8-inch tires on 65mm rims. You can get up to 5-inch tires on 100mm rims, and such a bike might make short work of these sandy stretches. Someone will have to come try it out and report the results! 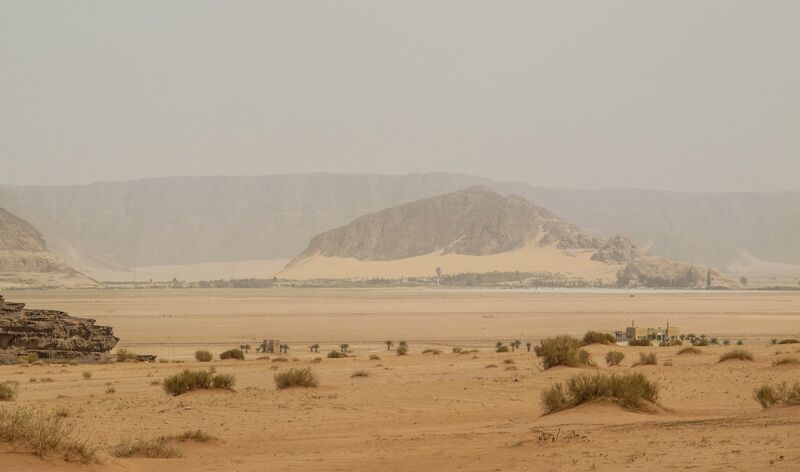 Above the camels, the summit of Jebel Um Ishrin - if you can't tell, it's around 2300 feet (700m) higher than the valley floor. Someday I'll need to convince myself it's worth spending money on a guide to climb all the highest mountains in this area. Who wants to split the cost with me? We aimed our wanderings northward from Rum. 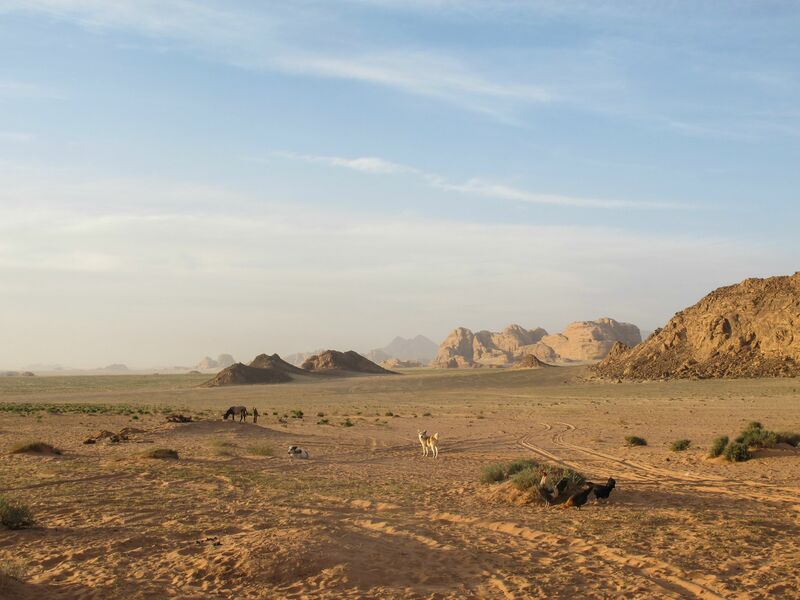 Not far to the east was the high plateau of Jordan's eastern desert, a vast table-flat expanse reaching all the way to Mesopotamia. 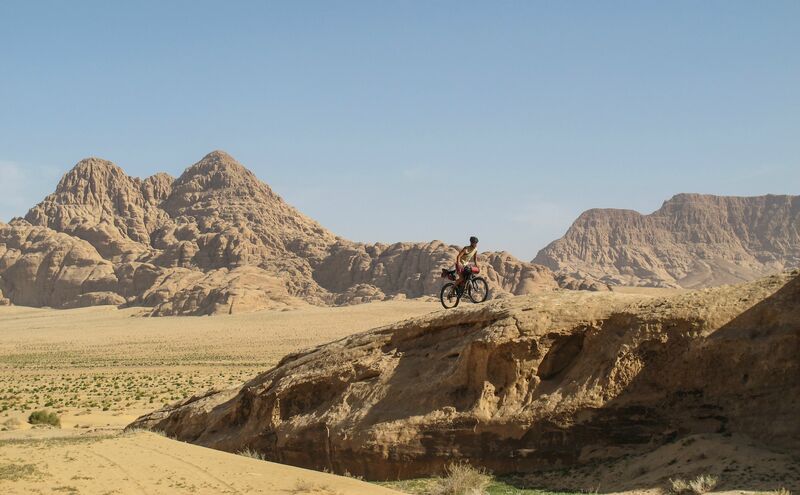 From the edge of it, a collection of oddly straight wadis run down; this unusual terrain caught our eyes and we thought it might be fun to ride up to the edge of nothing and camp there. 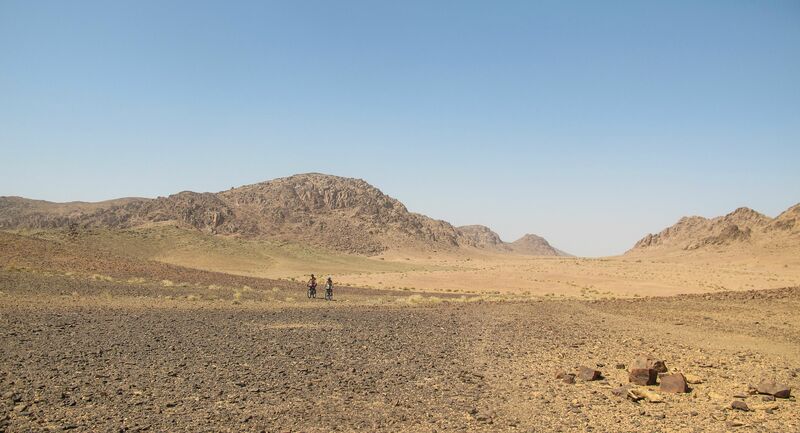 We'd have a supply stop in Diseh and then be able to reach Humeima the following day for more water. 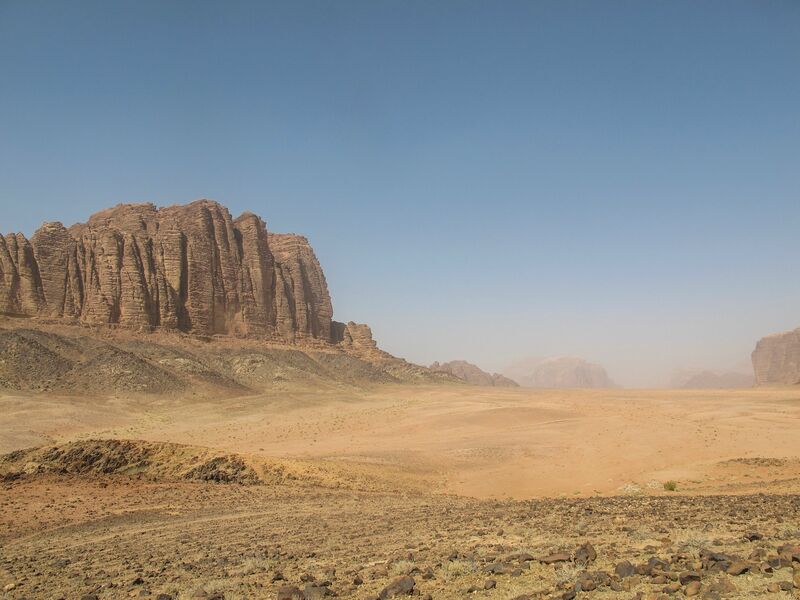 On the edge of the Wadi Rum Protected Area, a guy in a pickup rolled over and introduced himself as a Wadi Rum ranger. Presumably he was; certainly no uniform or other documentation was in evidence. 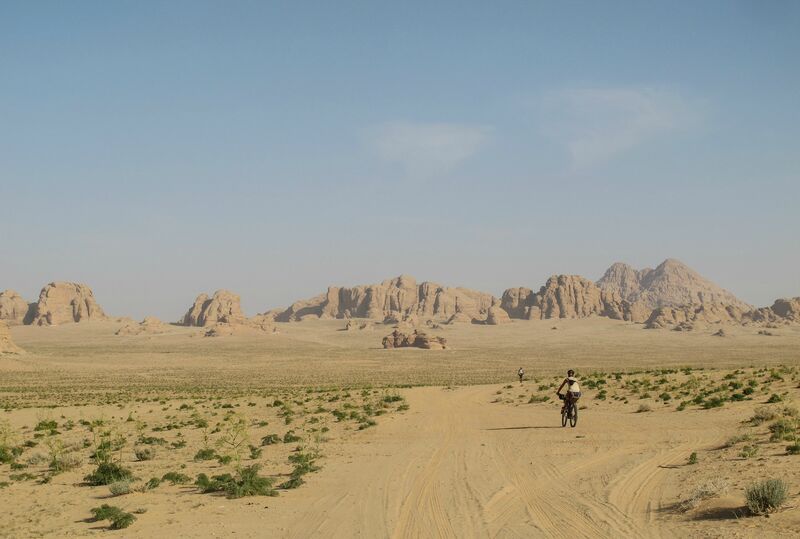 He let us know that bicycling wasn't allowed in the protected area, but as we were headed north out of it, there was no problem. Why cycling wouldn't be allowed in a place where every valley has a minimum of several jeep tracks scarring it is beyond me; regulations like this often aren't made with much foresight or understanding (recollections of various bans on hammock camping, which has much less impact than using a tent). I also have no idea if that is in fact a real regulation. If so, it'll be worth trying to change...but I also don't anticipate most cyclists would have much trouble with its enforcement. 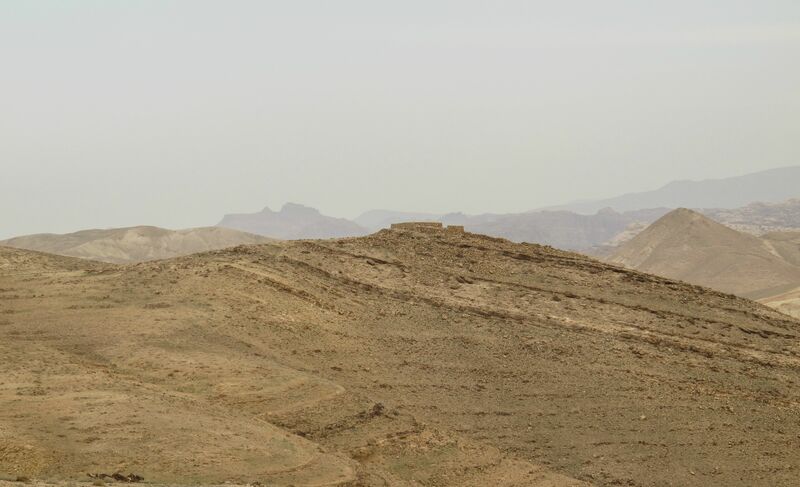 At the top of a hill, as Nick and Lael waited for me to catch up, a gaggle of little girls strolled over, nowhere near as timid as most female Bedouin. 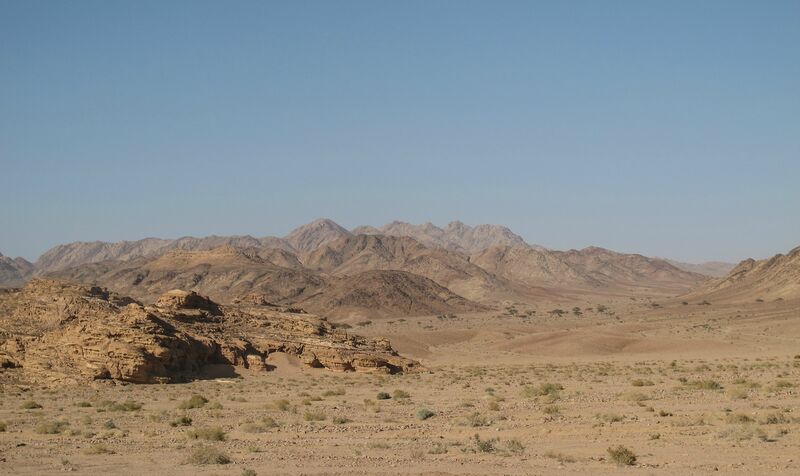 They displayed a most impressive knowledge of the area and of the route to our next landmark (Jebel Kharaza), particularly for the oldest being no older than ten. When they inevitably invited us for tea, I suggested we accept. It proved to be quite a pleasant little teatime with the family - at least for me, since I had enough Arabic to keep a conversation flowing about geography and the health of the various livestock. It also featured a little flute music by one lady (who must have been one of multiple wives judging by the gender ratio among the adults), and the grandfather describing his climbing routes up the impressive peak just outside the tent. 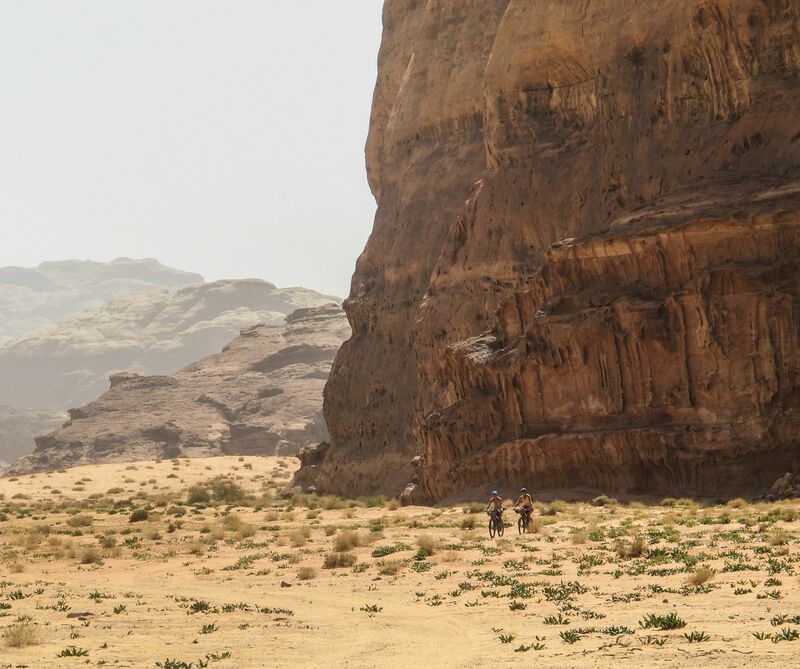 I mentioned our ultimate destination as Petra, and confirmed by the names of landmarks that the Abraham Path route we'd scouted by the guidance of a Bedouin from Wadi Musa last year was the same way this family knew of - there's one piece of trail, at least, that follows a traditional route. 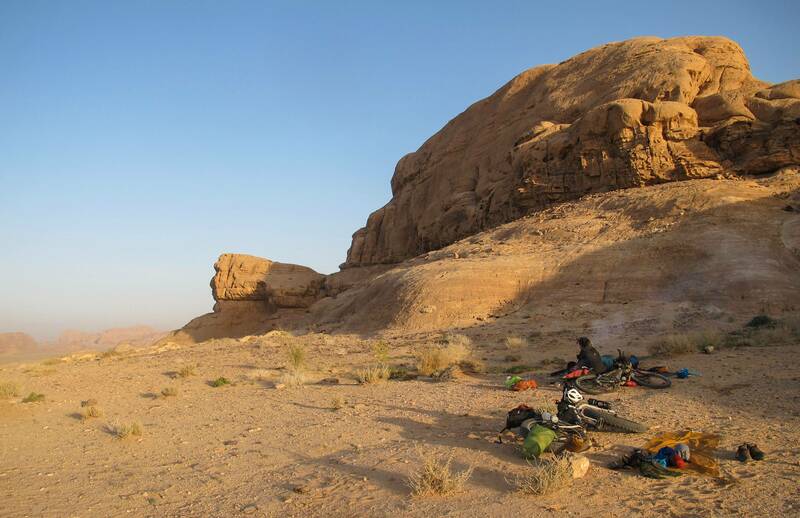 We learned from Fahet (the father of the proto-tribe of children who surrounded us in the tent) that this area was called something I can transliterate only as "Al-Ghdheh" - it would look tidier written in Arabic. Spelling grotesqueries aside, I was taken aback when he told me the name meant something to the effect of "a lot of trees" - there wasn't a single one of those to be found anywhere outside the villages. He clarified that the name was an old one. We reached Humeima right around lunchtime, and decided to indulge in one of the chickens that was grilling at the closest restaurant - along with guzzling a liter of mango drank each. Lael went off for her typical run, while Nick and I relaxed and pondered maps. Then everything went bananas. A nearby boys' school must have let out for lunch, and this restaurant seemed to be its cafeteria. At least fifty little dudes flowed in, corralled by one teacher. At first, the pursuit of food kept them from mobbing us too much, though throughout, the littler ones kept trying to mount the bikes, only to be roughly pulled off and reprimanded by the older kids. Once faces were stuffed, though, everybody wanted to talk. This endeavor was complicated by the inability of the crowd to put forth less than three or four speakers at any given time. One particularly persistent tween, seeing that I spoke some Arabic, took it upon himself to convert us from our heathen ways. In theory, saying you're Christian ought to satisfy the proselytizing instincts of a good Muslim, but not so for this young believer (quoth: "Islam good! Christians bad!"). Thanks to the language barrier, the level of theological discourse was quite crude, and on his end seemed to feature great emphasis on the importance of a luxuriant hajji beard, as demonstrated by vigorous miming. Eventually the youths were herded back to whatever education awaited them, and we could enjoy some grilled chicken in peace. 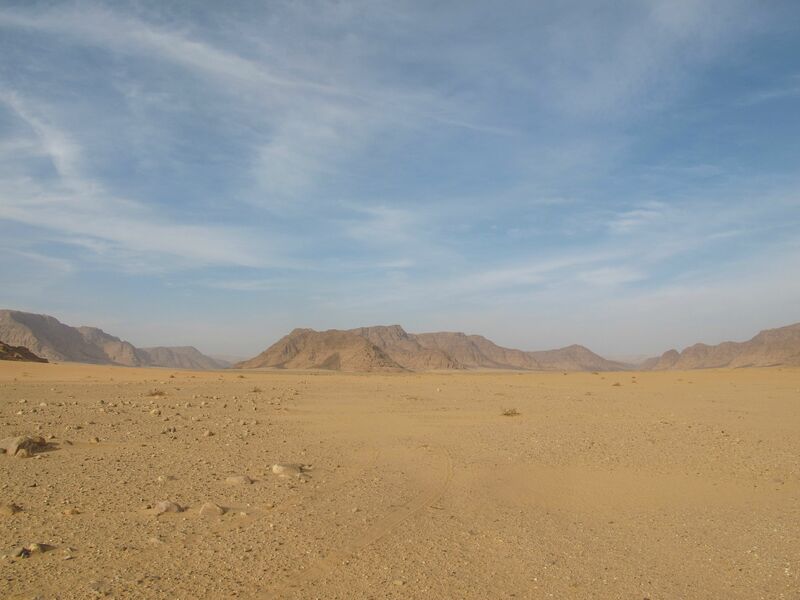 Humeima became a quiet, dusty backwater once again. 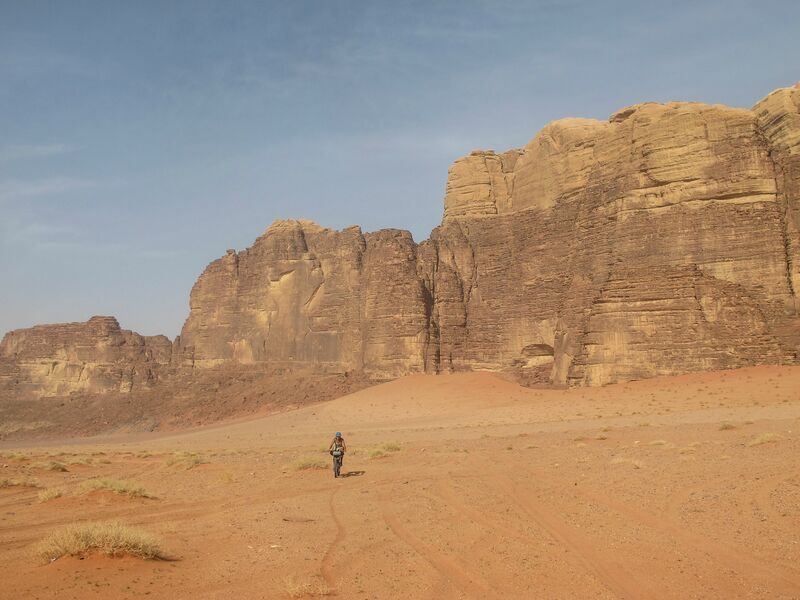 Although I felt we'd barely begun to tap the potential of southern Jordan for bikepacking, I was extremely pleased with this trip. 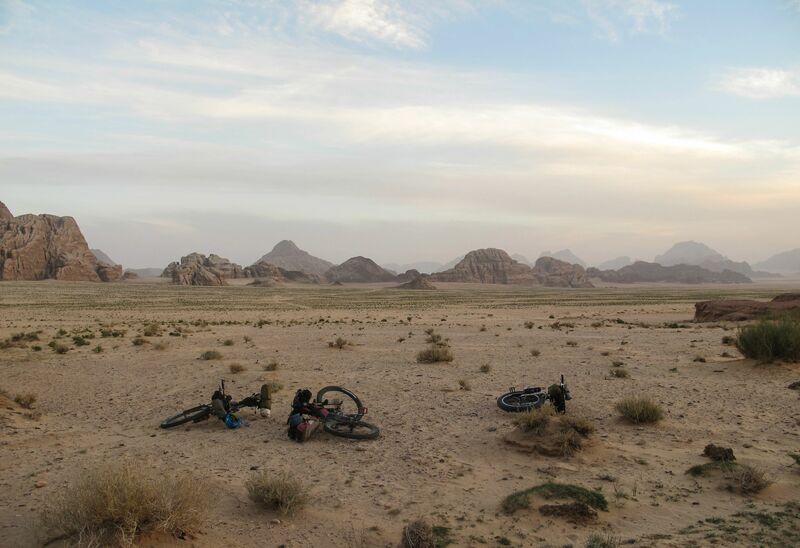 I had a blast despite the persistent flat tires, and found that the distances between villages here, though they make self-supported backpacking tough, are no trouble at all on a bike. 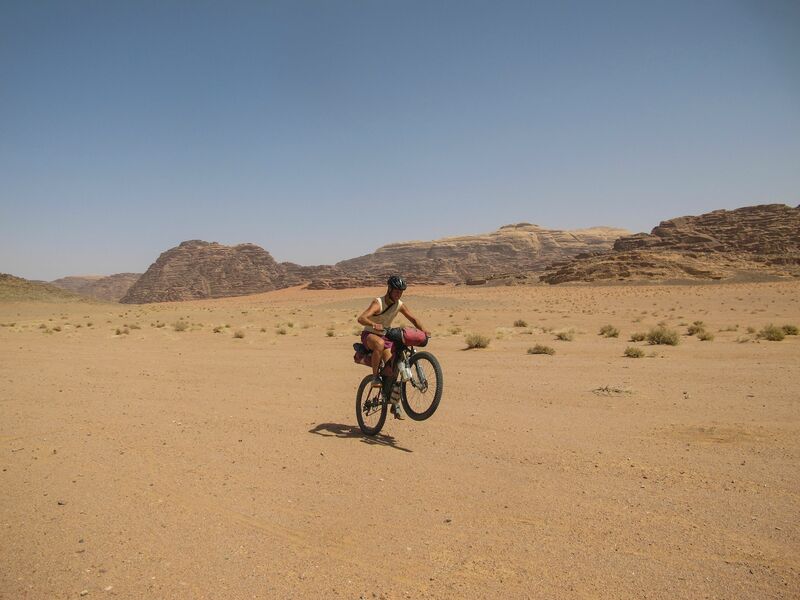 I also got to be the first person to fatbike in Wadi Rum (that I know of), an activity I hope there will be much more of in the future by me and others - a combined biking and mountain climbing trip around the area could be a treat. 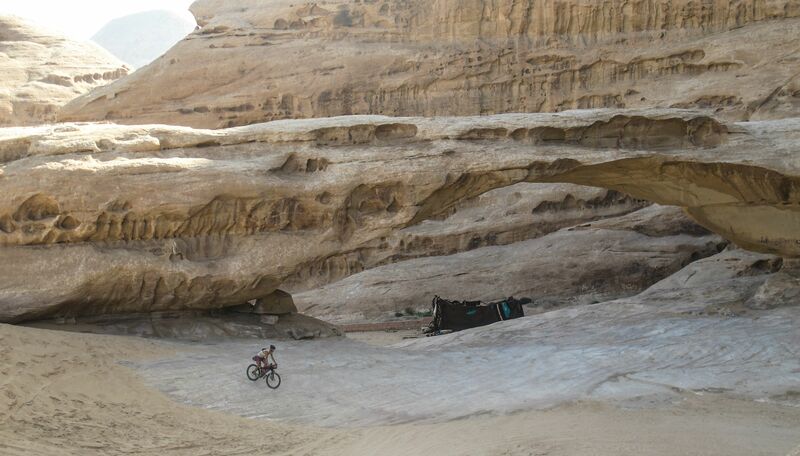 The terrain is definitely fatbike-friendly, at least in the areas south of Wadi Beer Hamed and Humeima. Nick and Lael's 29ers did fairly well on most of it, but they found it to be a slog; I was much less impaired and found the riding around Rum to be very fun overall. 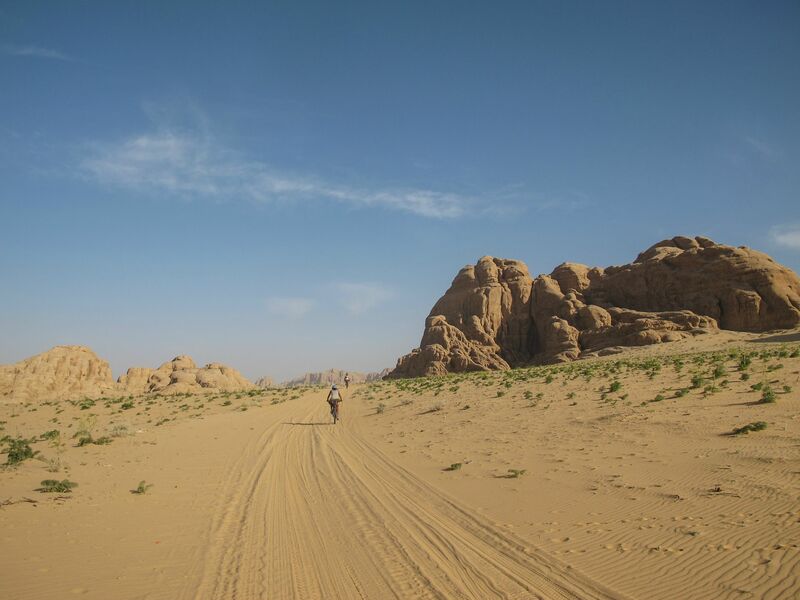 Certain areas have much softer sand than others, and it would take some scouting and asking around to come up with some optimal fatbike routes that take you into areas where normal bikes (or hiking shoes) make travel a chore, but without forcing even fatbike riders to walk. 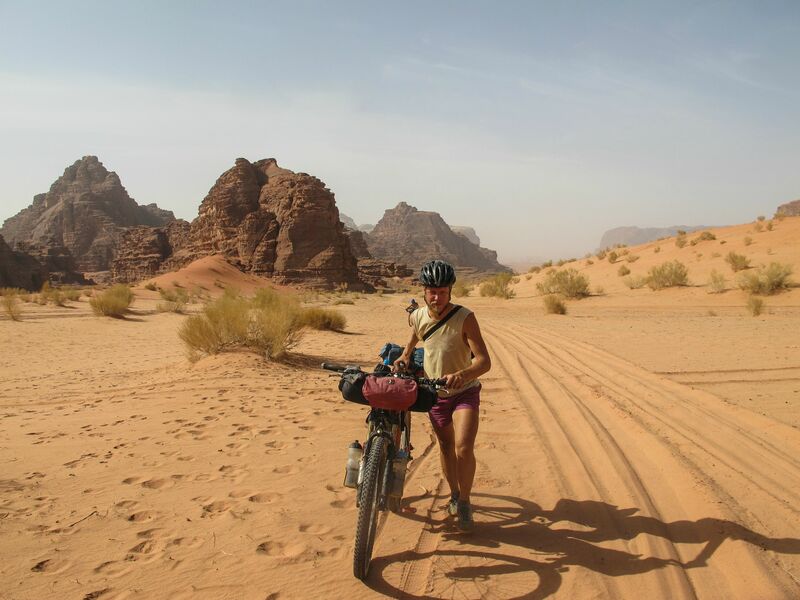 Overall, the northern areas of the Wadi Rum Protected Area, especially Wadi Um Ishrin and the route from there to Diseh, had the softest sand and made for the worst riding. 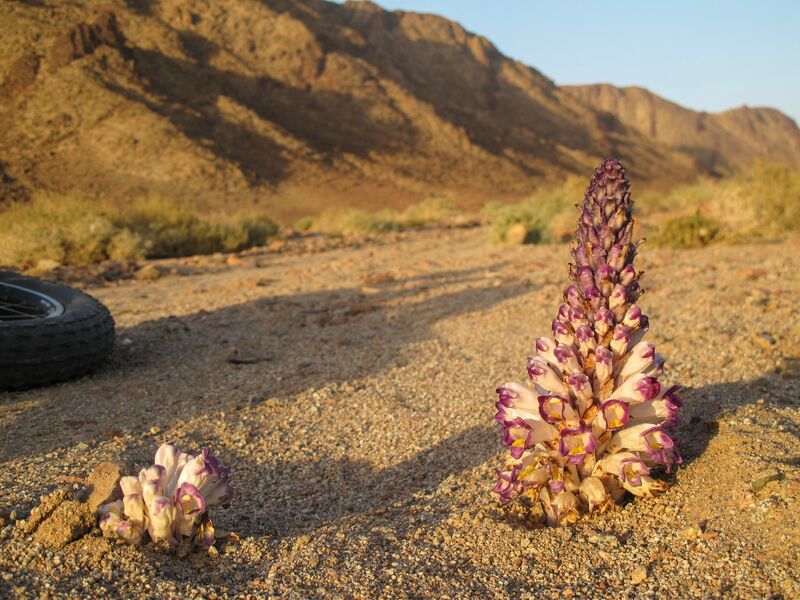 The southern reaches of Rum were much better, though they did feature thorny plants we saw nowhere else - as always in the desert, you'll probably be happier for going tubeless. My persistent flats were actually not because of the thorns (my front tire got only one thorn puncture and was repaired easily and without relapse) but I was sold on the concept of tubeless nevertheless. Wider tires and rims could have done me some good too, as the Pugsley had 3.8-inch tires on 65mm rims, the narrowest combination that qualifies for the title "fatbike." In terms of supplies, we ended up hitting a village every day, and never needed to carry too much water. I had capacity for eight liters and was happy to have it, as it helped with camping in between water sources, but we never needed to carry more than a day's worth of food. Standard bikepacking bags can definitely cut it, and my carrying a backpack was probably excessive. Nick and Lael, despite being on a months-long tour, are lighter packers and neither carries a backpack; they had no packing-space issues either. Navigation is another key issue. 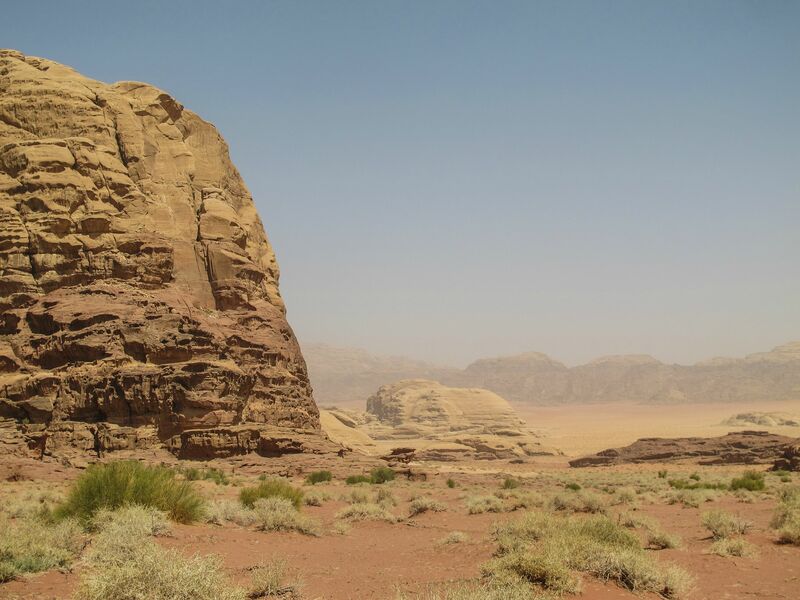 There are no readily-available topo maps of Jordan in general at present, and certainly none geared toward outdoor recreation. The best you'll find in that vein are (in my biased opinion) the free Abraham Path maps, and there are also maps in several hiking and scrambling guidebooks you can buy. All of these, of course, only cover the areas around specific routes, and so won't be of much use if you're on a more exploratory or free-form trip - other than letting you know where some definite water/food stops are. 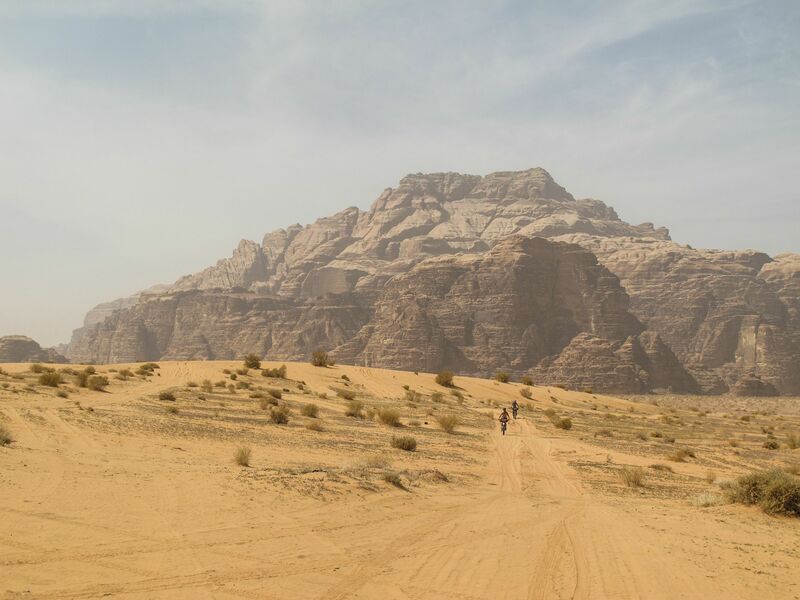 I used Maperitive to download OpenStreetMap data and topographical data, combined with GPS tracks covering my existing knowledge of Jordanian routes and supply stops, and we got by quite well on these. The OSM data was incomplete, of course, but did include a number of major jeep routes which we were able to follow when desired and which, in many cases, proved quite scenic. An OpenMTBMap basemap (incorporating the same OSM data plus rough contour lines) loaded onto my GPS proved a very valuable supplement to this; so did the set of GPS points I had, indicating the locations of a few towns, landmarks, springs, and wells. 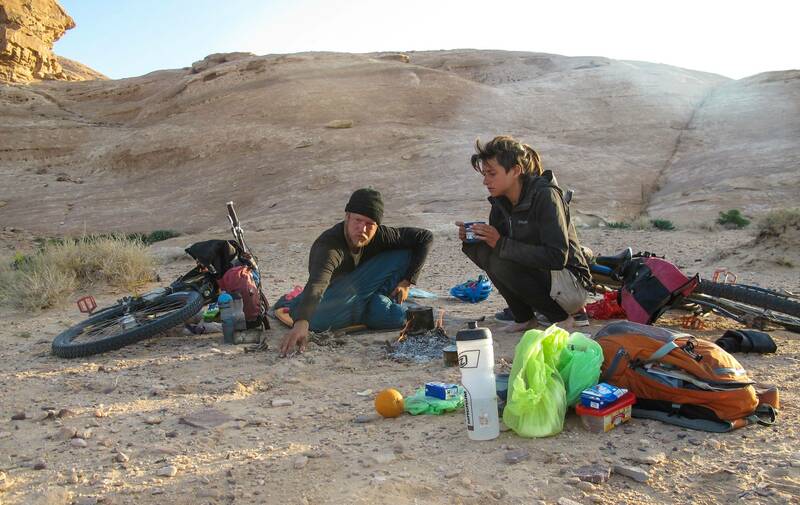 It's impossible to find white-gas canisters for camp stoves in Jordan as of now, and apparently alcohol fuel is also an issue. We made small campfires, Bedouin-style, but even these minimal fires are pretty environmentally unfriendly in the arid environment. Multifuel stoves that can use gasoline if needed are probably the best way to go if you must heat things up. 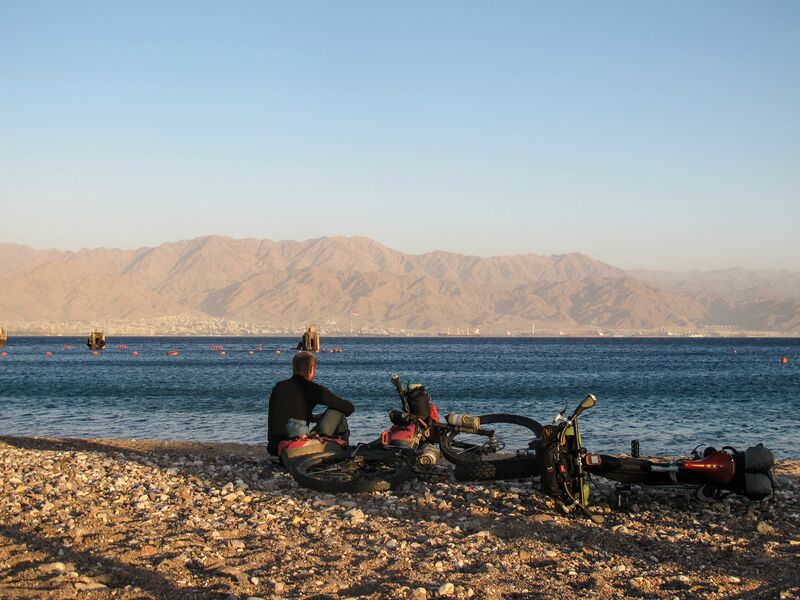 The Eilat-Aqaba border crossing is also a little tricky with bikes. 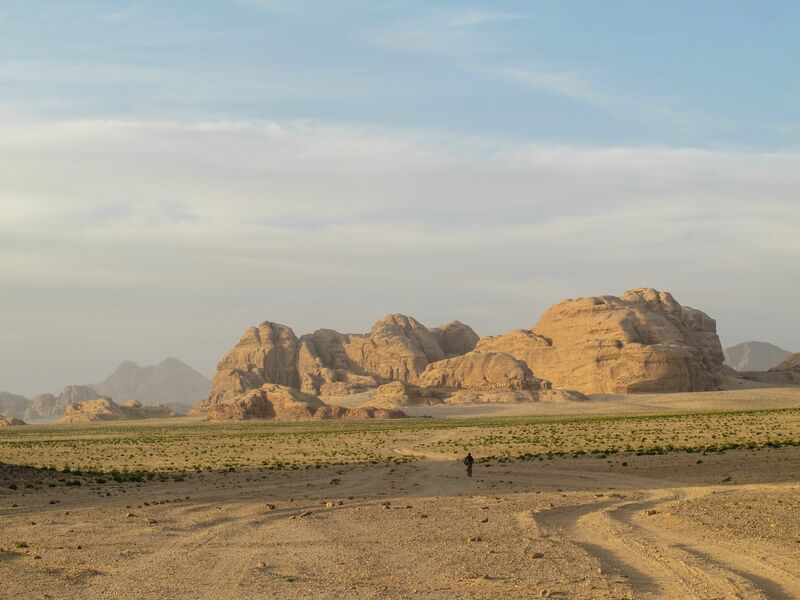 Due to the presence of a (small) military zone immediately on the Jordanian side of the border, in which all but hired taxis were prohibited, we'd booked a minivan on the other side to bring us through the forbidden zone and drop us off in Aqaba for a head start on the epic climb ahead. In retrospect, we might have saved our money and tried to employ the usual delicate mix of sweet-talk, affected naive-tourist status, and over-confident bluster to allow us to ride those 500 meters until the checkpoint. 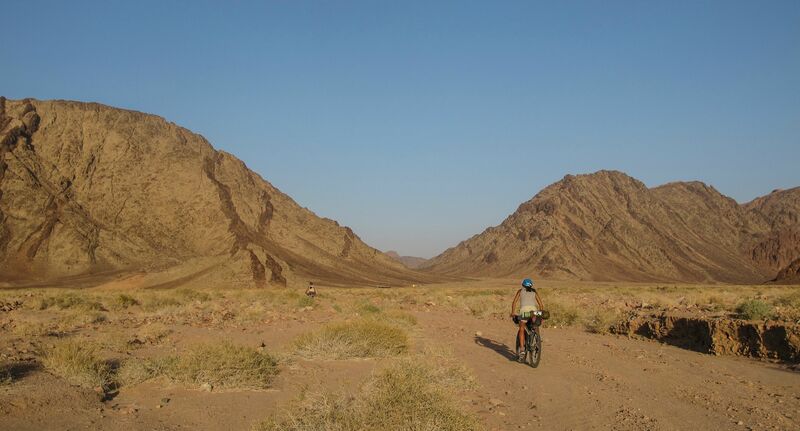 We crossed back to Eilat separately and when we joined up again, I learned that Nick and Lael had ridden right up to the border without issues. 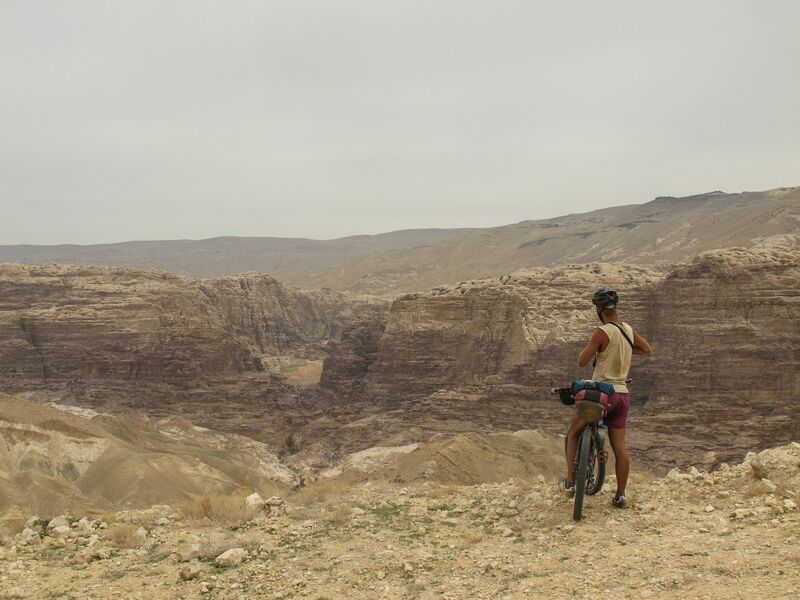 On the Israeli side, there are no traffic restrictions and you can move freely. The official website for the Israeli side of the border crossing does say that it's prohibited to cross with a bicycle, but we didn't meet with any protests further than having to remove the wheels to go through x-ray machines. I'd also be willing to bet you could talk your way through the small military zone on the Jordanian side without having to pay a taxi. 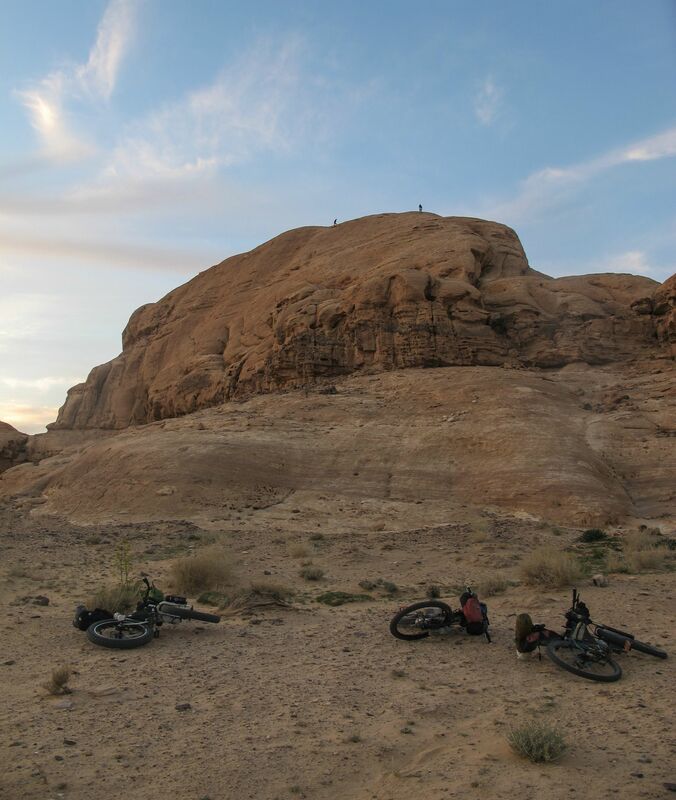 Still, I wasn't too regretful of the several-kilometer horizontal, and more importantly, 130-meter vertical head start on the intimidating climb that awaited us from sea level to the highland deserts beyond the stark Aqaba Mountains. 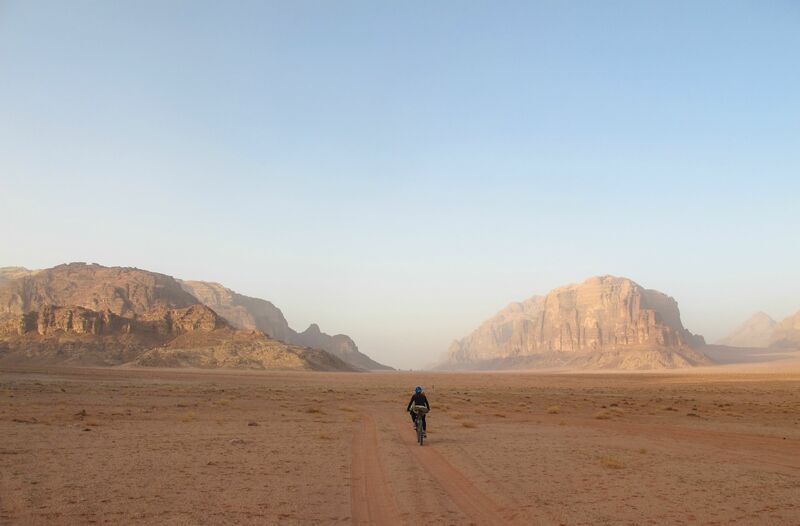 Jordan makes a fantastic place to bikepack. 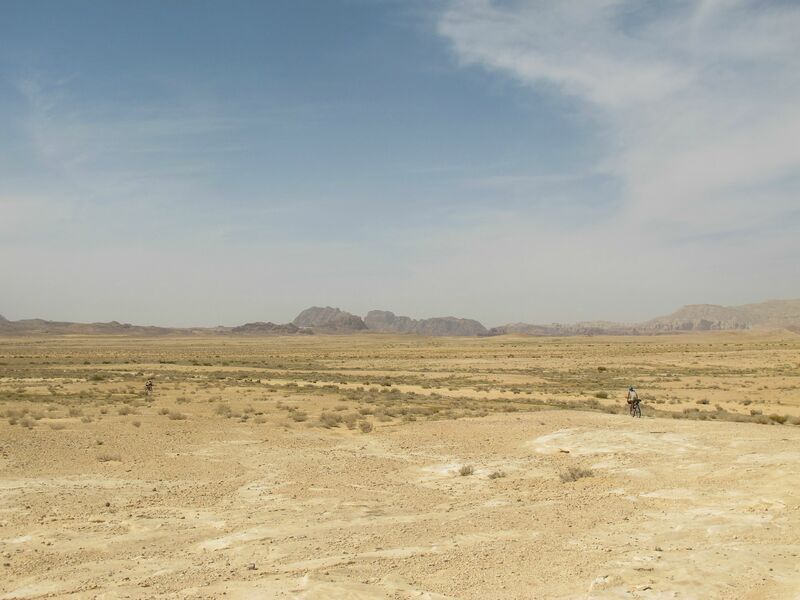 I'd venture a guess that this southern stretch is about the best place for it, not just because of the scenery, but because it features widespread flattish places which actually have scenery; elsewhere there's a very thin line between the utterly featureless eastern desert and the extremely jagged canyon country which could throw bike routing for a loop. 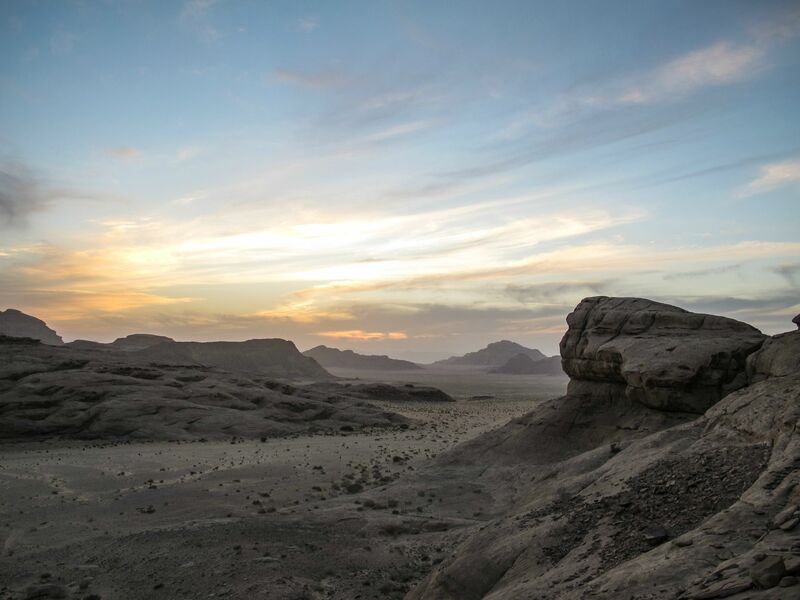 There are enough jeep tracks throughout the country, though, that you could piece together any number of long-distance tours - as long as you're willing to take on very circuitous routes, and heinous amounts of elevation gain and loss in quick succession. The country enjoys a well-deserved reputation as one of the friendliest and, perhaps more importantly, most stable countries in the Arab world. Granted, with its neighbors including two embroiled in civil war, one with nearly-impossible visas, and one which in between revolutions is known as the regional epicenter of financial and sexual harassment of tourists, it's maybe not a competitive league. But, slightly pushy wannabe-guides aside, everyone we met was immensely friendly and helpful - a very pleasant happy medium between countries so unaccustomed to tourism that every social interaction with the mind-boggled locals becomes a burden to weary travelers, and those so glutted with it that nobody cares much about you one way or the other except to try and squeeze money from you. 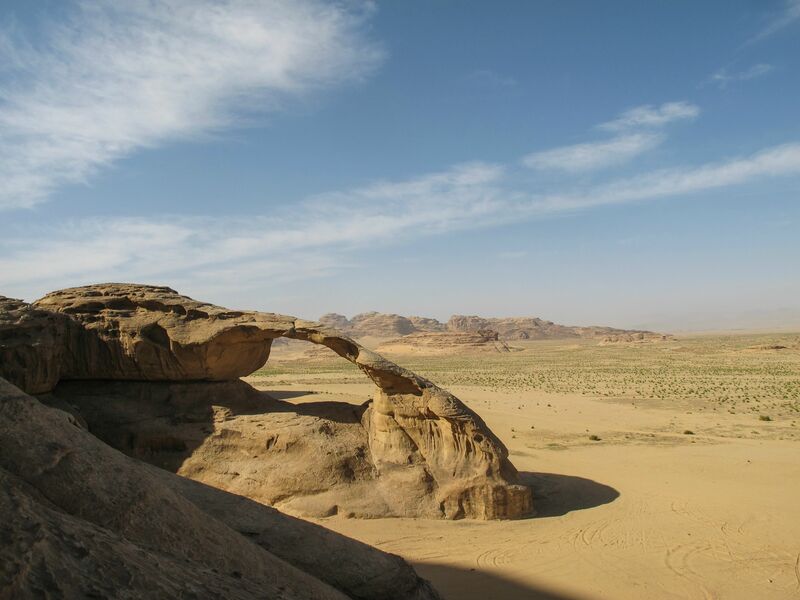 It's a place I'd thoroughly recommend lovers of the outdoors to plan a trip to, whether it's climbing, canyoning, bikepacking or trekking on the Jordan Trail or elsewhere with the fast-growing local hiking scene.